Hope all of you are having a great summer and finding ways to beat the heat. Of course a nice brew or from the Yakima Valley may be a good idea! Tieton Cider Works keeps improving their new facility. They have bocce’ ball along with a great outdoor area perfect for summer outings. In addition, they’ve released new ciders including a smoked pumpkin cider. The craft beverage makers in greater Yakima have banded together to develop a new marketing entity called Craft Beverage Yakima. Thirteen craft beverage makers from ‘gap to gap’ are part of the organization. Check them out! If you have not been to the new Hop Nation Brewing Company in downtown Yakima do stop by and hoist a pint by Master Brewer Ben Grossman. What separates this brewery from others is their focus on Washington agricultural products, specifically Yakima Valley Hops and Columbia Valley grain, and their relationship to award winning beer. It offers a tasting room to share with you its tasty, fresh, and uniquely hand-crafted brews. The brewery and pub is located off of North First Street in a one hundred year old fruit packing warehouse that was last used to house hops. The décor is an homage to the hop industry and features quarter rounds, kilns, hop poles, and hop twine integrated in everything from the lighting to the bar. The first four beers on tap included a German style Hefeweizen, an Oat Pale Ale, an ESB, and an IPA. With clever names like ESBeotch and EGO IPA (which stands for Everybody’s Got One) & great taste, you’ll have to try one. A partner with Hop Nation Brewing is HopTown Pizza, which cooks up mighty fine provides wood fired pizzas Wednesday through Saturday at Hop Nation. They’re a mobile wood fired pizza truck that also caters events and at other locations. They’re getting so popular that they’ve added a second truck to keep up with demand. They use all local ingredients in their food and of course, flavor the pies with a sprinkle of hops as an ode to their family history. (Porky Pine and Hop DaddyDo are my favs). As always, we’ll keep you posted of news and updates along the Spirits and Hops Trail. Enjoy! As spring sprouts in the Yakima Valley new craft beverage products are also springing up along the Spirits and Hops Trail. Last week we stopped in to Bron Yr Aur Brewing Company outside Naches to check the progress of their brewery. As you can see, construction is moving at a fast pace and the Hattens told us that they’ll open in late March. Bron Yr. Aur (pronounced brawn-rah-err) means ‘Hills of Gold’ in Welsh. At the family ran Naches Mercantile next door they currently serve ten regional craft beers. They also serve home-made pizzas and their crust is amazing! Meanwhile, Hop Nation Brewing Company is brewing up their beers and is slated to open in Downtown Yakima soon at 31 N. 1st Avenue right near the railroad tracks. In addition to a tasting room, this brewery will have hop, beer and wine analytical laboratory testing. Once Hop Nation Brewing opens, a new addition to the scene Hop Town Wood Fired Pizza is slated to to serve their lip smackin’ pizzas 5-6 evenings a week on site. Here’s an interesting tidbit on Hop Town Pizza: In honor of her hop farming parents Lester and Emma Roy, daughter Lori and staff sprinkle a small amount of Cascade hops on every pizza. The Roys are credited with being pioneers in the growing of the Cascade hop strain. And here’s a tasty spring treat…have you tasted the new lollihops by Yakima Hop Candy? These are the funnest things to have come along in some time! 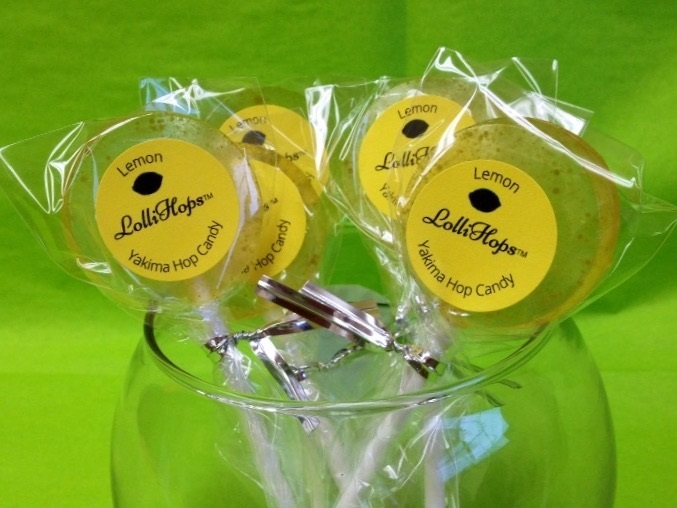 Their lollihops are infused with local hops and come in such flavors as passion fruit, blood orange, lemon and mango. Heather with Yakima Hop Candy told us that more candy delights are in the works so stay tuned for those updates. They’re candy is available at our Information Center near the Target store in Yakima or click here for other outlets. So have a great spring, enjoy locally crafted beverages, pizza and candy and we’ll see you along the trail! Have you seen the new package design for Tieton Cider Works? Be on the watch as they roll out the designs this month. The Washington State based, family owned company has been creating craft cider for six years and currently produces 13 different offerings. According to their release, the new label design is targeted toward developing a strong sense of terroir – or “Tieton”. “Six years ago the craft cider business was virtually nonexistent,” explains owner and third generation orchardist, Craig Campbell. “Our original labels – with the word “cider” pronounced and centered– were designed to assist in the development of an entire category. With so many new brands entering the marketplace, we felt the need to focus on Tieton and Yakima – and their deep sense of place”. Craig and Sharon Campbell own and operate nearly 400 acres of land, known affectionately as Harmony Orchards in Tieton (pronounced tie • uh • tun). They’ve been farming commercial apples, cherries, apricots and pears for over 30 years and selling to many stewards of high-end produce for equally as long. Then the cider-bug hit! “We began to research the utter absence of bitter-sharp and bitter-sweet apples planted within the United States,” said Campbell. “And we decided that we would press forward and plant many varieties of these artisan cider producing apples while remaining loyal to craft production”. Today, the Campbell Family has 40 different types of bitter-sharp and bitter-sweet apples planted, along with 11 types of Perry pears utilized to make their CAMRA certified Sparkling Perry, a Champagne-like drink poised for a renaissance. The Campbell Family orchards are far and wide and require a 30 minute drive time between plots of sprawling land. For the Campbell’s, and much like the way the wine industry boosts of a sense of place, their secret to great cider rests in the very ground they plant and manicure daily. From a humble start, beginning with their flagship apple cider called Wild Washington, Tieton Cider Works has expanded and currently produces seven core ciders, including Cherry, Apricot, Dry Hopped, Tieton Dry Blend, Blossom (a slightly sweeter cider ALSO releasing in March), and Spice Route (a new offering releasing in July). Seasonal ciders include, Smoked Pumpkin (releasing in July), Holiday Cheer (releasing in October), Frost (an ice-wine style cider released in October) and Wind (a port-style cider released in October). 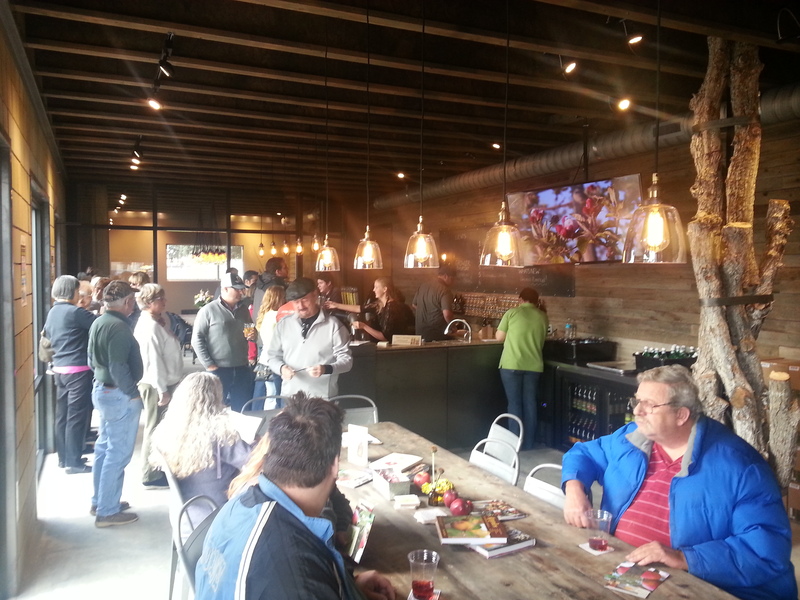 Tieton Cider Works opened their new 35,000 sq. ft. production facility and tasting room in Yakima for cider tastings this past winter. 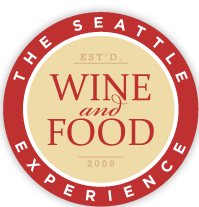 The Seattle Wine and Food Experience is this Sunday and the Yakima Valley will be there in force! In addition to a number of local wineries and other beverage providers, Yakima Valley Tourism is a Gold Sponsor and will host a double booth full of locally crafted bites and beverages. Our prime sponsor to attend the show is Tree Top. As a result, we’re bringing Chef Kristin Johnson over to serve up tasty morsels using Tree Top products including honey crisp glazed vanilla peach palmiers, BBQ Chipotle cherry apple compote tarts, three apple Glacier Basin Cherry Brandy spritzer and a Chukar Cherry tart fruit smoothie chocolate. Like YUM! On the beverage side we’ll pair these delights with a Syrah from Gilbert Cellars, a Viognier from AntoLin Cellars, an apricot hard cider from Tieton Cider Works and Bale Baker Brewery Topcutter IPA. General Admission tickets are $55 and available at http://www.seattlewineandfoodexperience.com. Must be 21 and over to attend. Hope to see you there! 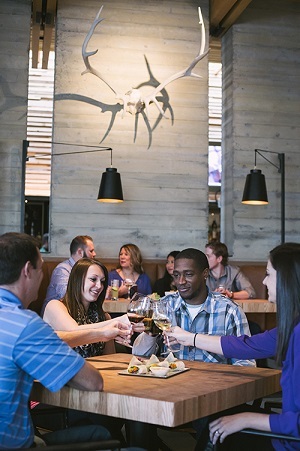 Cowiche Canyon Kitchen & Icehouse Serve It Up! When the Cowiche Canyon Kitchen and Icehouse Bar opened in December, it ushered in a new era of dining experiences in Downtown Yakima. Graham & Kaulin Snyder are owners of the new dining establishment. Snyder accomplished his idea of creating the ambiance of a “polished American Tavern” with help from Graham Baba, a Seattle-based architect firm. The firm is known for their attention to detail and designing buildings that allow opportunities for local design, construction and craftsmanship. Snyder envisioned that the design, food and service of the restaurant would reflect Yakima’s agriculture. “The building design is inspired by fruit warehouses and the topography of the Pacific Northwest,” states Snyder. The theme of a “polished American tavern” is carried out in both the exterior and interior of the building. The outside of the restaurant has concrete “boards” that resemble the rustic look of wood that is visible throughout construction process. The interior is surrounded in booth seating and an open kitchen. Customers experience the excitement of watching the preparation and presentation of what they ordered and a view of downtown Yakima while they enjoy their meal. The main dining room can seat up to 130 people and the space is used thoughtfully, providing hooks on the outside of booths and under the bar for coats, purses and scarves. The Icehouse Bar (reminiscent of a modernized fruit warehouse) is meant to have a similar look to fruit cold storage rooms built in the past. The interior features blocks of “ice” that are actually hanging simulated light fixtures. 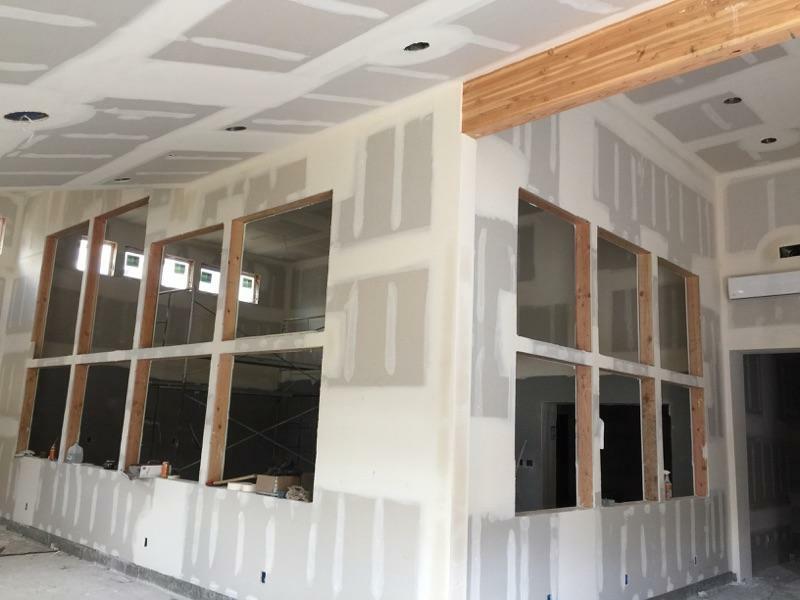 While choosing contractors, suppliers and other miscellaneous items for the restaurant, Snyder was conscientious in supporting the Yakima Valley by using local craftsman contractors and recycled materials. The material for the hostess station was made out of old wood from a local hop warehouse, while the greenhouse flooring came from bricks salvaged from the old Terrace Heights elementary school. Light fixtures in the Icehouse came from old smudge pots used to prevent frost in local orchards. The restaurant’s menu reflects Yakima’s farm fresh bounty. Snyder describes some of the dishes as “thoughtful renditions of American Classics.” He continues to carry on the family tradition of having their own bakery area, as his grandfather owned the local Snyder’s bakery from the Great Depression era until the 1980’s. Whole roasted chickens, prime rib and chicken pot pie are a few of the unique meals offered. The Icehouse Bar cocktails are made with freshly squeezed juices and herbs that are home grown inside the restaurant’s greenhouse. The Bar is dedicated to offering unique spirits not easily found at other locations, local distillers, and some small labels from Europe, Japan and South America. Three beer tap handles have also been dedicated to experimental blends from Haas Hops. Snyder was born in Yakima but grew up in Southern Idaho and graduated with a degree in social sciences from the University of Southern California. Prior to owning the Cowiche Kitchen and Icehouse Bar, he owned the Osteria La Buca restaurant, in Hollywood. Next time you’re in town check it out, plus try the other dining and craft beverage options available in Downtown Yakima. 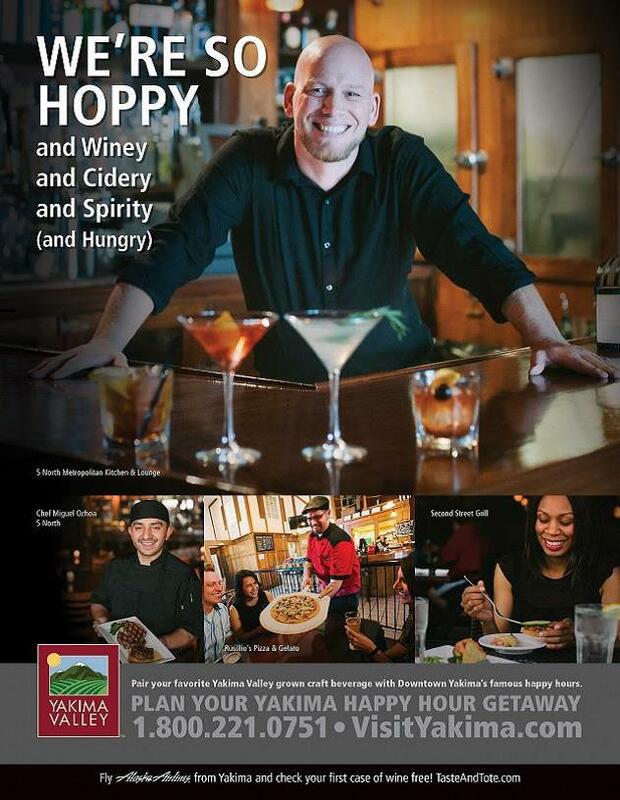 Mai Hoang of The Yakima Herald Republic penned a great feature today about our efforts and the City of Yakima to further position Yakima as a craft beverage destination. We’re excited with the city’s commitment and all that we have accomplished the past year to market the craft beverages of the region. What does the future hold? In 2015 we’ll be updating the Spirits and Hops Trail website plus print a map of the various craft beverage outlets on the trail. We’re also working with writers and bloggers that to host in the area and produce stories on the trail, the stories behind the craft beverages and dining opportunities. In addition, our marketing efforts will focus on fun food experiences and craft beverages. Currently we have a series of ‘We’re So Hoppy’ ads running in various lifestyle magazines including Sip Northwest and Northwest Travel (see sample at left). So here’s to the new year and see you soon along the trail! It’s down to the wire, the final days of the year. Scrambling for that special gift or special beverages to ring in the New Year? Try some products from the Spirits and Hops Trail. First off you might want to visit any number of our wineries for your holiday dinner wine or as a gift. Many of the wineries also have a range of wine related gifts including novelty cork screws, wine glasses, coasters and more. Everyone wants a little bubbly for New Years so consider some Treveri sparking wine to ring in 2015. Our choice would be the rose’ but really, you can’t go wrong with any bubly! A fun alternative for New Years Eve is a hard cider or two. Popular choices include the cherry or apricot ciders from Tieton Cider Works in Yakima. 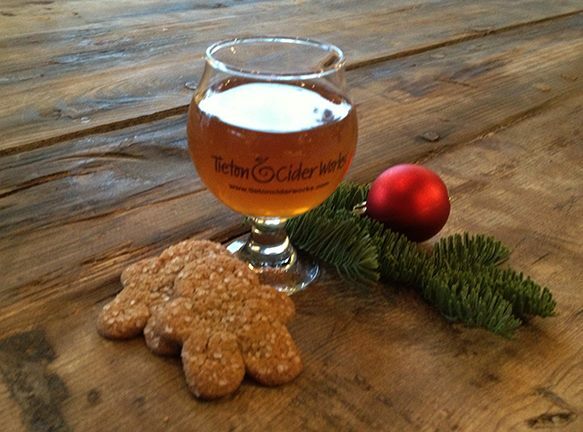 Or try their Gingerbread Holiday Cider, a limited release only available at their tasting room. It’s filled with nutmeg, ginger, and hints of vanilla. Then again, a hearty beer might be in order to chase away the cold of a winter night. In that case consider Twin Stag from Yakima Craft Brewing Company, a Scottish Ale ‘…perfect as a complement to good conversation and long, bold tales.’ If you’re throwing a grand New Years party consider getting a keg of High Camp Winter Warmer from Bale Breaker Brewing Company near Moxee. This seasonal brew is named for the ski lodge on top of the White Pass Ski Resort. And while Glacier Basin Distillery does not appear to have any special events at the Ranch this time of year, you can always find their fine distilled products at various local outlets and restaurants. From all of us along the Spirits and Hops Trail in Yakima & the Yakima Valley we wish you a joyous and safe holiday season. Remember, enjoy responsibly! Last Saturday, Tieton Cider Works had their grand opening for their new 35,000 square foot production facility and Cider Bar at 619 West J Street. With that celebration another craft beverage operation comes to Yakima. It joins four existing wineries (AntoLin Cellars, Gilbert Cellars, Kana Winery and Lookout Point Winery) and two breweries (Yakima Craft Brewing Company, which has two tap rooms, and Berchman’s Brewing Company, which has begun brewing in West Valley just this week. Though not in Yakima, let’s also give a nod to nearby Bale Breaker Brewery). There’s also three distilleries in Yakima or close by (Swede Hill Distillery, Glacier Basin Distillery and Scenic Acres Orchard) plus the bars, pubs and eateries that offer locally crafted adult beverages. And it doesn’t appear to be ending there. Sources tell me that other breweries and wineries are in the works for Downtown and beyond. That’s great news. In a way Yakima is coming full circle. It was the birthplace of the modern day microbrewery/pub scene when Bert Grant opened the first post-prohibition microbrewery in 1982. Sadly Grants Brewery Pub closed down some years later and it was not until 2007 that Yakima saw another brewery open when Yakima Craft began operations. It’s only natural that the brewpub scene would come back to Yakima. Our region grows some 75% or more of the hops in America, and much of it is processed in the City of Yakima. Likewise, with the vast quantities of wine grape and fruit production the Yakima Valley it’s fitting that more wineries and distilleries are popping up around town. These are among the reasons why we created the Spirits and Hops Trail in the summer of 2013. The site celebrates our agricultural heritage through the craft beverages that make Yakima and the Yakima Valley special. Another goal of the Spirits and Hops Trail is to help the craft beverage industry to grow and prosper through marketing and media relations. In the coming months the website and related projects will expand to include additional features about our craft beverages, festivals that celebrate and promote them plus the people behind the scenes making it happen. As always we’ll keep you posted on new developments in the beverage scene in Yakima and beyond. In the meantime, enjoy this Evening Magazine TV segment on Tieton Cider Works.